A very safe album for a band that apparently wants to push themselves in the music they make. 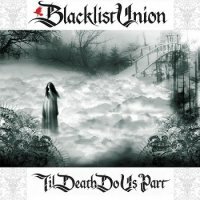 'Til' Death Do Us Part' is the third full length album from Los Angeles based Rock 'n' Roll band Blacklist Union. BU itself consists of solely Tony Wets but the album has been recorded with well-known guests including the majority of American Rock band Saliva and also Hunt Sales (the drummer that has played for David Bowie's Tin Machine and Iggy & The Stooges). The album was produced by Chris Johnson (Goldfinger, Josh Todd, Hillary Duff) and with all this in mind, there seems to be high hopes. Formed in 2004 BU has had its fair share of ups and downs – '... Part' being one of the downs. Sold to be an outright Rock 'n' Roll band with a bad attitude - the only thing bad here are the songs. The "attitude" of the band is very dissimilar to that which is generally a given from Rock 'n' Roll along with the fact that the album is a lot darker due to the nature of the themes and down-tuned guitar. The opener, which is the title track, gives a Grunge imprint to the band however songs like 'Alabama Slammer' have a Teen Rock, Alternative impression – it's a track that maybe would be affiliated more with the likes of My Chemical Romance, not a Rock 'n' Roll band. 'Diggin' 4 Gold' is one entry that does stand out in the album; there is a clear influence from Ozzy Osborne vocally and musically. Here lead guitarist Jon E Love has an opportunity to really play with the guitar parts, especially in the solo, but in many songs it feels like the lead guitar is cut off before it even gets started. It is not really the musician's ability that is lacking here; it is the absence of passion, emotion and how the album flows that lets it down. The band has evidently done a mixture of Hard Rock, Grunge, Alternative Rock and Doom; these different foundations could have been developed a lot more. It is a very safe album for a band that apparently wants to push themselves in the music they make.